From the beginning, music has been a powerful force in creating the richness and fullness of the human experience with heart and soul, body and mind. Throughout the world, diverse cultures have engaged in creative musical expression to strike the powerful and resonant chords that celebrate humanity’s place and purpose in the cosmos. To this very day, the magic of music touches our lives, nurtures our being, stimulates our senses and sparks our spirits with passion and joy! “Music, Culture, & the Creative Spirit” beckons us to revisit the simple and humble beginnings of primitive music and explore the discovery and deliciousness of elemental music in all its wonder. 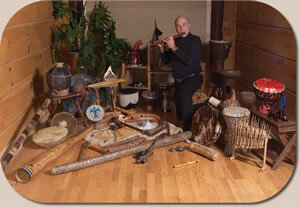 “Music, Culture, & the Creative Spirit” presents an attractive display and interactive performance with a multitude of primitive wind and percussion instruments. These simple yet exotic instruments have been fashioned from natural materials—bamboo, clay, skin, stone, wood, gourds and shells—virtually unchanged since their discovery and use centuries ago. The striking sounds and soothing melodies they bring forth reflect human creativity and ingenuity at its finest. And... since music is such a dynamic and joyful experience, lighthearted audience involvement and active participation with instruments is invited and encouraged whenever possible. This presentation also offers opportunities to join together in the oldest form of musical expression—the power of human voices singing together. “Music, Culture, & the Creative Spirit” music profoundly touches us all as we celebrate the human experience! $275 per 45–75 minute presentation. Discounts will be offered for multiple programs in same location and to groups assisting arrangements of multiple bookings in one area. Nominal travel, lodging and sound equipment fees will be added to program costs if applicable.